Intersection of Sixth and Main Street is closed for a traffic collision investigation. Please use Grand Blvd as a detour. 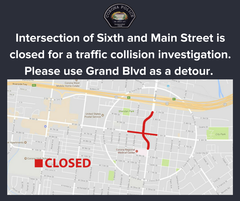 Intersection of Sixth and Main Street is closed for a traffic collision investigation for approximately four hours. Main is closed from Third Street to Eighth Street. Sixth Street is closed from Ramona Avenue to Sheridan Street. Please use Grand Blvd as a detour and avoid the area if possible. Thank you.